January 1987 Jim Park was lost overboard from the 82 foot fishing vessel Jeanoah, 10 miles south of Sitkalidak Island during tanner crab season. January 28, 1987 The 32 foot fishing vessel Lovac went missing and was presumed sunk. Owner Jim Shutter and one other crew-member were believed lost. The vessel was involved in the black cod fishery at the time of the disaster. February 4, 1987 One crewman was lost from the 40 foot fishing vessel Pacific Star when they were hit by a rogue wave in the Aleutians southeast of Agattu Island. Five other crewmembers were rescued. February 8, 1987 An explosion and fire destroyed the Japanese longline fishing vessel Eukoyoshi Maru 65. One person was lost and 25 rescued by the sister ship Eukoyoshi Maru 8. February 21, 1987 An unidentified crewman was lost overboard from the fishing vessel Alliance. March 25, 1987 Michael E Roberson of Anchorage was lost overboard during a black cod opening from the 60 foot fishing vessel Nova. April 22, 1987 The 93 foot crab fishing vessel Jamie Lynn sank while being towed by the processor Long Harbor, 90 miles north of Dutch Harbor in Wells Bay. Lost were skipper Chris Clark of Cordova, Isaac Zacharof (23) of St Paul and Anton Kochegin (18) of St Paul. May 5, 1987 The 56 foot halibut fishing vessel Chabro sank 80 miles southeast of Seward. Everett Collins (59) of Soldotna was lost and four others rescued by the fishing vessel Kodiak. May 5, 1987 One person was lost when the 47 foot halibut fishing vessel Kahiltna II sank 55 miles from Cape Resurrection. Five others were picked up from a life raft by the fishing vessel Sea Scape. May 5, 1987 The 42 foot seiner Hotline sank near Nuka Bay with four persons aboard. Lost with the Hotline were Rich Liston of Anchorage, James Carnegie of Stirling, Jim Fuller and Burt Logan. May 11, 1987 David E Gerou of Edmonds WA died of apparent hypothermia when his Zodiak overturned while attempting to assist the crab fishing vessel Pavlof. Gerou was a crewman on the Tempest. May 31, 1987 Seven people from Galena were lost when their unnamed 22 foot river boat capsized between Koyukuk and Galena. Lost were Bessie Cleaver (30), Raymond Paul (35), Louis Nelson (32), Dafney Evans (17), Barney Paul, James Demoski and Greg Wholecheese. June 4, 1987 Kelly Joy (29) of Kodiak was lost from the vessel Saga in Dutch Harbor. June 6, 1987 An unnamed 24 foot johnboat sank in eight foot swells between the mouth of the Susitna River and Ship Creek in Cook Inlet. Only two of the four that were on board survived. They were rescued by another group of passing sport fishermen. June 16, 1987 The 86 foot Miss Universe sank in the Semidi Islands on a trip from Chignik Bay to Alitak. Three crewmembers were lost including Howard Broadway of Kodiak, Karen Spector of Madison, Wisconsin and Leonard Gridley. June 19, 1987 Tom Banks of Kodiak was lost when the 44 foot Cape Chacon capsized and sank 50 miles S of Montague Island. A U S Coast Guard Helicopter picked up three other crewmembers from a life raft. June 29, 1987 Willfried Stache (52) and Rodney Launders were lost when the 22 foot houseboat Sea Turtle foundered in western Cook Inlet. July 14, 1987 One person was lost from the processing vessel Galaxy in Dutch Harbor when hit by a boom. July 25, 1987 The 43 foot fishing vessel Binki sank near Admiralty Island with the loss of one crewman. Two other crewmembers were picked up by passing fishing vessels and one was plucked from the sea by a U S Coast Guard Helicopter. September 4, 1987 An unnamed river raft capsized near the mouth of the Duktoth River four miles from Cape Yakataga and two of the three on board were lost. Guide Jonathan Price managed to swim to shore, but Spanish nobleman Manuel Alvarez de Estrada (43) and his guide Peter Zack did not survive. September 11, 1987 An unnamed small boat disappeared with four people on board 40 miles west of Dillingham. The boat washed ashore over a month later with no one on board. September 15, 1987 The 127 foot trawler Nordfjord disappeared with five persons aboard 200 miles S of Valdez on her way to the Bering Sea via Unimak Pass. Lost were skipper Gudjonroy Gudjonsson (28) of Bellevue WA, Marty Mercer (24) of Seattle, Chris Boss (21) of Seattle, Gretar Halldorsen (40) from Iceland on work visa, and Bill Schmalfeldt. October 13, 1987 An unnamed 20 foot plywood skiff flooded and sank near Sheldon Point on the Yukon River and four seal hunters from Marshall were lost. The empty boat was found near the mouth of the Yukon six days later. October 29, 1987 Frank Loren Waite (34) fell overboard from his boat near Sitka and died of hypothermia. November 1, 1987 Skipper John Fowler was lost when the 40 foot troller Rex sank southwest of Sitka. An empty life raft and some debris were all that was found. November 5, 1987 The 112 foot trawler Uyak II sank off of the south end of Kodiak Island with six people on board. Four of the six were lost. Brian VanVelkeningburg (29) of Kodiak and Bradley Talbot (28) of Des Moines, WA were saved. Lost were Gregory D Klinkenburg (29) of Kodiak, Rogerio N Jamie (32) of Anchor Point, Donald Brand (44) of Tacoma and Hee K (Charlie) Im (37) of Gardena, CA. What was the name of the cewman lolst aboard the Binki which sank off Admiralty Island in July 1987? I do not know, but have sent out a query to a colleague who may be able to research the loss of the Binki. I will update when I have heard a reply. suit. His body was found washed up on shore, I believe, on Kodiak Island. All of his immediate family (mother, father and sister) are dead. I am trying to help his nieces find our where he might have been buried. “The 42 foot seiner Hotline disappeared with all hands May 6, 1987 near Nuka Bay on the east coast of the Kenai Peninsula. Lost with the vessel were skipper Rick Liston of Anchorage, Jim Fuller, James Carnegie of Sterling and Burt Logan.” This is the excerpt from my book ALASKA SHIPWRECKS: 1750-2010 that mentions the loss of James R Fuller. I looked at the Seafarer’s Memorial at Homer and see that James Carnegie is mentioned. I haven’t found much else in newspapers or other sources. I am sure that there were stories in the papers at that time, I just haven’t found them. I will keep looking. RIP Jim Fuller. May 6th 1987 F/V Hotline, this might help you .. Sorry for your loss. I have several of the news stories that were circulated back then but would be interested in anything you have. I am currently working on a book that details the worst shipwrecks in Alaska history and intended to include the Hotline. I have over 3,700 Alaska shipwrecks in my records and am writing about the top few hundred wrecks. Bringing to light these wrecks may be helpful in preventing others. I would also be very interested in any stories or rumors you have heard about what may have happened. I can keep our conversations private if you would like. Hi Vanisha, I would love to talk with you about the Hotline. My cousin James Fuller was on the Hotline when it went down. It took months for them to locate our family New York. 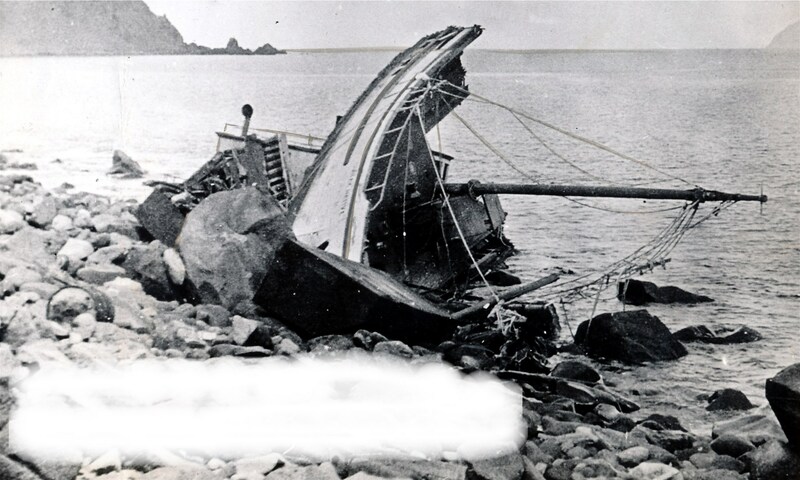 There was also an article in Alaska Fishermens Journal shortly after the loss of the Hotline that mentioned the bodies of skipper Rick Liston and crewman Jim Fuller washed up on the beach on Afognak Island 10 days after the Hotline went missing. Afognak Island is just north of Kodiak Island and south of Nuka Bay where they were last seen. You could probably call the Kodiak Daily Mirror newspaper in Kodiak and get someone to look up the information you need. Editor Roni Toldanes of the Mirror is very interested in shipwrecks and I am sure would help you if you called. The number at the Mirror is (907) 486-3227. If you talk to Roni, tell him Captain Warren Good sent you and I am sure he will be very helpful. I am in Florida and unable to help much myself. Thank you so, so much. We had not heard from Jimmy for about two years at the time of his death. He had sent his sister a tape saying hi and talking about what he was doing, etc, but by the time we got it he was dead. It took the authorities about four or five months to trace his sister to Cassadaga N.Y. His sister was killed in a car accident in 1996 so his nieces and I have been trying to track down information. We’d like to visit his burial site this next year but have no idea where that would be. All of the arrangements were handled by his sister through a third part in Alaska. I am hoping that in the formation that you provided will bring us closer to our goal. I have contacted friends in Kodiak and Anchorage who are looking into what happened to Jim Fuller. I will let you know if we are able to find any information. Hello I was a good friend of Jim’s did you find out were he was buried? Spent a lot of time in the early 70’s . RIP JIM . I have a copy of the 41 page Alaska State Troopers report from the loss of the Hotline and subsequent investigation. They spent a great amount of time trying to identify Jim. It appears his body was sent to Anchorage for autopsy and then back to Kodiak. He was identified visually and by fingerprint. The last I see him mentioned is by the coroner at Kodiak who was looking for next of kin. I would presume they buried him there in Kodiak. You are more than welcome. What was Jimmy’s sisters name that died in the car crash? Thank you Linda. I have forwarded the information to Toby Sullivan at the Kodiak Maritime Museum. He is filing a request for information from the Alaska State Troopers. He will send what he finds out to your email address. RIP Jimmy and Barbara. Sorry for your loss. The only place that may have a recording of any radio conversation with the Miss Universe would be the U S Coast Guard Station that picked up the call. I don’t know where the old radio calls that may be kept are archived. I would call the U S Coast Guard District 17 office at Kodiak (907) 487-5700 and see if someone there could help. District 17 is Alaska. Try Juneau (907) 463-2065 and Anchorage (907) 428-4140 if Kodiak doesn’t work out. Another possibility is the Alaska State Troopers. They often keep records that can be obtained by going through a filing process. They sometimes have transcribed records of the radio conversations. Patience is important in dealing with both agencies. Good luck and RIP Howard Broadway. I have corrected the spelling of your Father’s name on this website and will expand the edit to include my books. If you visit my Facebook page called Alaska Fishermen RIP there are a couple of pictures that other fishermen have sent in of the Uyak II. I was fishing joint ventures out of Kodiak and Dutch Harbor at the time of the loss of the Uyak II. The Uyak II (ex Atlantic Pride) and conversations about it are in one of the 10 photo albums on that site. If you have difficulty navigating it, let me know and I will email the pictures to you. Sorry for your loss. my name is Natasha Brand captain good i looked at your facebook page i liked it. how often are you on there? and is there any pictures of my dad during that time do you know? Hello Natasha. I do not have any photos of your Dad. There are several Facebook groups that have members that may remember the Uyak II and your Dad. Two of them are people who were living in Kodiak during the boom years of the 1970’s and 1980’s. I will see if I can get a response from anyone that may remember him. Did he have any nicknames that you have heard. Many of us had names that we called each other. Hawaiian Mike, Seattle Sid, Wild Bill, Monster and things like that. Many people never knew their friends real names. They only went by “handles” or nicknames. Another interesting note is that the sister ship to the Uyak II was the Amazing Grace. She disappeared in a storm off the east coast with seven crewmen aboard. At that time (1984) the Uyak II was called the Atlantic Pride. my name is Natasha Brand I was born after my father passed away on the Uyakll in 1987. if any of the survivors are still on this site please contact me on facebook.